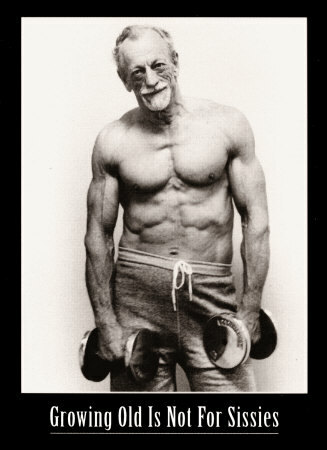 I want to be in this awesome of shape when I’m older. Look at them! They’re fabulous! So you can’t avoid exercise. I know that. You know that. Everybody knows that. Sometimes, though, my belief system gets jacked. There are days when I just want to do finger exercises on the computer or potato chip exercises on the couch, and I have to nag myself to climb on the elliptical for a measly 20 minutes or get myself outside for five. But there are other days, weeks, even whole series of months, where the whole point of exercising just clicks into place and my belief system gets revitalized. Because I’m doing this for me. Because I want to stand tall. Because I want to defy the grumblers who think 80 is old and you might as well shelve yourself and stop bothering people. We can’t even retire (and survive) until we’re 70+–don’t tell me 80 is old! Because–and this is important–I want to be independent as long as I can. Even more, I want to enjoy getting there. Knowing that you got what you set out to get gives you such a glorious feeling. Knowing that you did the hard work to get there, even more. Today I went out walking on the trail behind my work. I felt young, vibrant, healthy. I felt like I could do this forever. And I thought of these two posters, first seen in college, as inspirations for those times when I don’t feel young, vibrant or healthy, and start thinking 80 is something to be afraid of. So here they are. What motivates you?